Dazzling Siopa Rince with loads of stage presence! 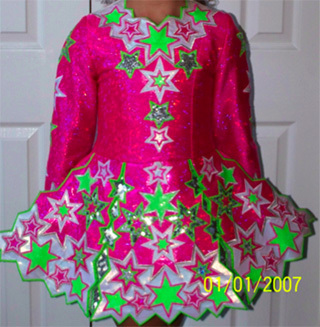 Sparkling raspberry base fabric with white satin, lime green sequin, and silver sequin stars. Features a shaped neckline, hem and cuff edges. Dress shows wear on inner sleeve cuffs where they rub against the dress. Missing some sequins. Includes cape, crown and 2 pairs of bloomers. There is approximately 1-2″ in let down.